Easy Packs-Developed to Save You Time and Money! 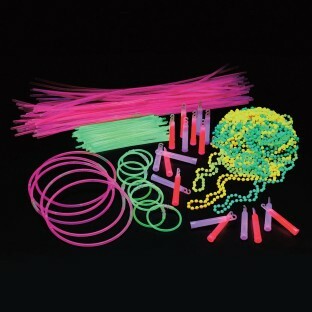 Fifty 8" glow bracelets with plastic joints. 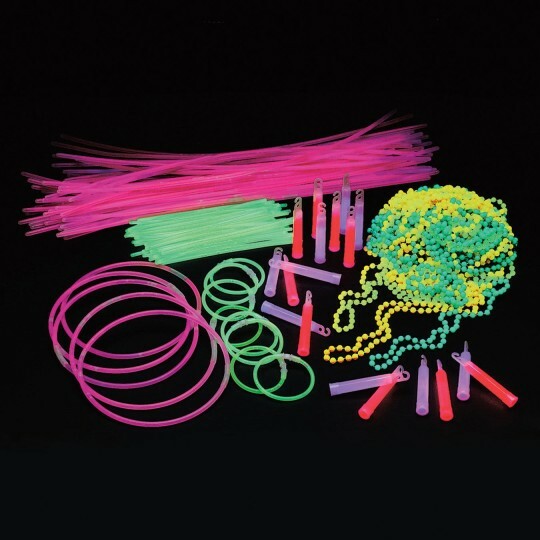 Fifty 22" glowsticks with plastic joints. A really great Value! We used everything as prizes and handouts for camp. The kids had a blast with everything...and nothing really pleases like glow-in-the-dark stuff! For the price this was a good package deal. However what you see is what you get: Only one color of the 22 necklaces pink green bracelets and only 2 colors of the glow sticks. The mardi gras bead necklaces don't glow well and the orange ones don't seem to glow at all. Don't think we'll get this package next time or the Mardi Gras necklaces at all.